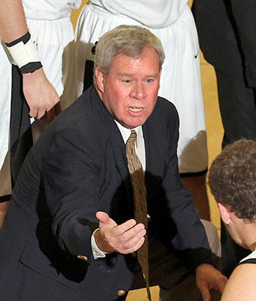 Contributor Adam Lamont breaks down Bowdoin’s last second loss at Middlebury on Sunday. With the game tied and out of timeouts, Tim Gilbride attempted to call an ill-fated timeout, sealing the win for Middlebury. But the problems for the Polar Bears are more nuanced, writes Adam Lamont. For the first 39:30 the game played out just like Bowdoin’s other two losses. Bowdoin’s defense, especially on the perimeter, played worse than its usual stingy self. Dylan Sinnickson and Joey Kizel both had big first halves getting good looks from the outside. The amount of open threes that Middlebury had was particularly disappointing. Bowdoin played primarily man-to-man though they would sometimes disguise it as a zone coming out of a timeout or stop of play. Man is not the defense this team is most comfortable playing and it showed a few times when players got caught watching the ball instead of sticking to their player. Swords was unable to shut down Jack Roberts who had a nice game scoring 10 points. He seemed just a little bit too slow in his reactions and Roberts did a good job keeping him off balance with his post moves. The Polar Bears made the occasional switch back to the zone for the short stretches when Kizel went to the bench. Bowdoin was burned earlier in the year when Duncan Robinson went off from outside, single-handedly rendering the zone defense useless. Understandably, Gilbride did not want Kizel, coming off a 30-point performance against Colby, to consistently get open looks. He still scored in the first half though it was in a variety of ways, both by pulling up from three in transition as well as getting to the basket. His playmaking in the second half kept the Middlebury offense going even after Bowdoin started to tighten things up defensively in the second half. Obviously a lot of (virtual) ink has been written about Kizel here. Seeing him and Toomey in back to back games was a real treat as well as a disappointing reminder to what Bowdoin is missing as Bryan Hurley continues to play his way back from injury. Hurley was a great floor leader for Bowdoin last year and was the engine of the offense, especially late in the shot clock. It is pretty clear that even though he has returned that Hurley will not be that player until next year. Matt Mathias has been great all season, but he isn’t the type of player who can consistently create for his teammates like Kizel or Toomey. Having a player who can create offense out of nothing in close games is what distinguishes the consistently great teams and may be Bowdoin’s missing ingredient this season. On offense Bowdoin only got into a rhythm during a few moments in the first half and the end of the game. Middlebury was the first team all year to primarily front Swords with weak-side help quick to double. The high-risk, high-reward strategy definitely played to Bowdoin’s advantage. Swords was able to out-battle Jack Roberts for three easy dunks (it felt like more) because the help side either could not get there in time or the pass came from the middle of the floor meaning nobody could help enough off their man to stop Swords. I found the strategy surprising because playing Swords straight-up forces him to make more difficult shots or pass out to the perimeter. Fronting him allows him to use his greatest strength, his size, to get him easy baskets. Swords finished with 16 points and probably should have had 20 considering he missed two point-blank shots and also five free throws. What fronting him did do, however, was limit the looks Bowdoin got from the outside because Swords’ touches were limited even though his scoring was not. The clean looks for Bowdoin’s perimeter players that often result from the attention Swords receives just weren’t there. Andrew Madlinger was able to hit a couple of threes, but he also fired up others that were contested because it was the only way he could get a shot off. This was especially true in the first half when Bowdoin only attempted four threes. The lack of threes in the first half made Grant White’s 11 first-half points all the more important because he was able to efficiently score off the dribble. The senior from Vermont had his best game offensively since the first game of the season. He has been more aggressive in the last few weeks getting into the lane and has become a good secondary playmaker for Bowdoin averaging 3.1 assists per game. His play helped offset subpar games from both Matt Mathias and Keegan Pieri. Mathias had a difficult matchup with Jake Brown harassing him for much of the game. Though his shot was off he still had four assists and more importantly no turnovers so he still found ways to produce when he wasn’t having his best game. The struggles of Pieri were a little more perplexing. He didn’t seem to get the ball as much as he has recently nor with the space he needs to work. Middlebury deserves some credit because the athletes like Jensen or Sinnickson that they can put on Pieri are impressive. He was virtually non-existent in the first half with only one shot taken and two rebounds. In the preview for this game I said that Lucas Hausman shouldn’t shot threes anymore which obviously meant that he went 2-2 from there on Sunday. He also uncharacteristically missed three free throws, which was a theme from Sunday. Bowdoin finished 13-25 (52 percent) from the line and though Middlebury’s misses down the stretch were more important, the cumulative effect of missing 12 free throws is immense. Five of those misses were by Swords who sits at 51.9 percent for the season. No team has employed a hack-a-Swords strategy yet, but we very well could see that this weekend at Bates Friday night, where there should have a raucous crowd trying to get into Swords’ head. Overall foul shooting has been a strength of the team all season and one game of poor shooting isn’t of too much of a concern. Losing at Middlebury wasn’t a bad loss considering all the talent the Panthers have, but it means this weekend will be a tricky one for Bowdoin. On paper the Friday game against Bates is an easy win, but the teams played an incredibly close game in December that came down to the buzzer. Tufts is a talented team that has struggled, but has pieces. Though Bowdoin closes with the bottom two teams in the league, they are by no means easy wins. Win both and one NESCAC tournament game and Bowdoin should make the NCAA tournament, but stumbling could put them on the bubble because they played an easy non-conference schedule and don’t have a signature win in NESCAC play. The Polar Bears have made up for it by running the table against the rest of their schedule, but if they want to make a run in either the NESCAC or NCAA Tournament they have to be able to beat tournament-caliber teams. This was written by Damon Hatheway. Posted on Thursday, February 13, 2014, at 12:18 pm. Filed under Men's Basketball. Bookmark the permalink. Follow comments here with the RSS feed. Post a comment or leave a trackback.